As you may have heard, I was a bit confused last week and made the soups instead of the baked apples. Oops. Not sure why, but there I was on Sunday night, trying to drum up the energy to make three (count them 3!) soups. I had all of the ingredients on hand, but it had been a very busy weekend and when dinner time rolled around I was just too tired and couldn’t be bothered. I headed into the kitchen thinking that I would pull a leftover soup out of the freezer and save the Dorie recipe for another night. Upon entering the kitchen I noticed that Dorie’s book was lying on the kitchen table, already open to this week’s recipe. Apparently I hadn’t bothered to put it away after making my grocery list. Out of either curiosity or procrastination I started reading the recipe and noticed that, while I might not have the energy to make all three soups, making one seemed like hardly more effort than reheating frozen soup. Seriously! And it wasn’t. I opened two jars of stock and brought them to a boil. Roughly chopped a zucchini, opened a bag of frozen peas (no asparagus to be found around these parts this time of year) and cooked them in the stock for 10 minutes. A quick blitz in the blender. Done! I think I was in the kitchen for no longer than 15 minutes and we had steaming bowls of tasty soup for dinner. The next night I made the broccoli and red pepper soups after I got home from work and found them to be equally satisfying. All three recipes checked the all important Easy, Quick, and Nutritious boxes for me. In fact, this week was an important reminder that foundation recipes, by which I mean the most basic form of any recipe, can be really quite satisfying. I could have dug around in my fridge and added cream or chopped ham or fresh herbs, or all of the above, and no doubt these additions would have been delicious. But the soups were also perfectly good on their own, without any refinement. Glad they fit the bill for you! Your soups look great, and I agree, they are a perfect way to use up tired veg. I’m glad you made these. I was surprised how easy they were to make as well. “And maybe I’m the only one, but I take comfort in the idea that after a long day, if I come home to only a few limp veggies in the crisper, or even just some forgotten bags in the freezer, I can still feed the ones I love.” < not at all! This is what I loved about these! Good improvising… it shows that this is an excellent foundation recipe that can really work with any veggie. I am always happy to learn a new way to use limp vegetables. Glad these worked for you too. These soups were easy to make and delicious. I made the Broccoli soup and it was yummy. The jars of stock sound infinitely better than the stuff from aseptic boxes or cans. So rewarding to finish a recipe that is just better than frozen pizza! lol. I probably would have liked the frozen peas in this soup. Sometimes Dorie’s book opens up on the kitchen table for me too. Its weird that way. Love your photo with all the soups on that beautiful tray. These were quick, easy, and delicious. Great point…I seem to always have those limp veggies in my fridge 🙂 Glad you enjoyed! I really enjoyed these too. The effort/output ratio was just the way I like it. I’ll never be able to say there’s nothing to eat in the house again. Great photos! The colors are so vibrant. I too love that the effort/output ratio was a no brainer, and took as much time as heating up frozen or pre-made soup. Have a great weekend! Definitely better than frozen pizza! Glad you liked these and they were pretty simple! It’s good to know how little we really need to make a meal. Having access to seasonings, though, means that I’ll be amping up soups like these – they were a little too plain for me. I used frozen asparagus and broccoli because there is no way I was going to pay 15 euro for a bunch of fresh asparagus! 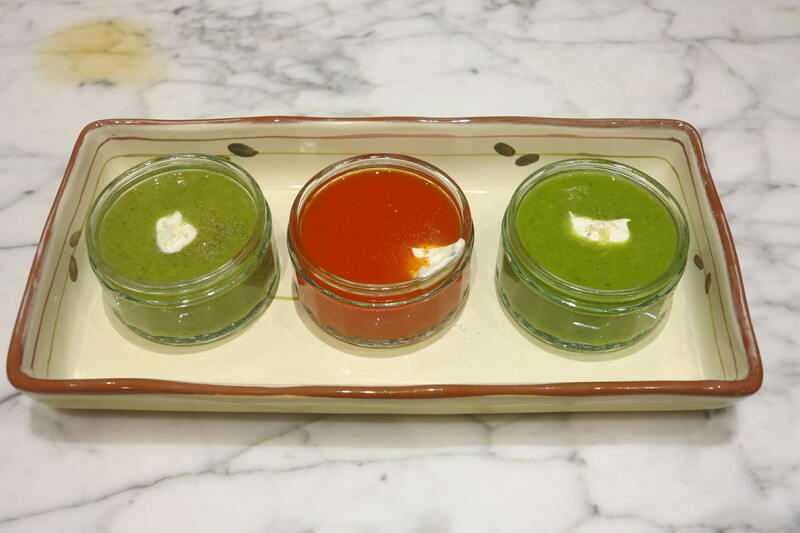 But I liked the soups very much and they were so easy and quick and perfect for my diet!! Totally agree on keeping it all simple. Even though I sometimes don’t 🙂 I never regret when I do. I can also totally relate to having all the ingredients and still trying to summon the energy after a busy day to knock out the “Dorie Food”. Luckily for all of us this was such a cinch. And while I hate to admit it, I usually have a leftover hunk of broccoli or such that needs to get moving, so I am delighted I have a simple and yummy way to put it to use. I’m glad you enjoyed these! I really like the tray you presented them on, it’s very pretty. I agree. Keeping expectations low might be the secret to happiness.